We have heard about many thousand dollar wedding gowns worn by the rich and famous. But get this. 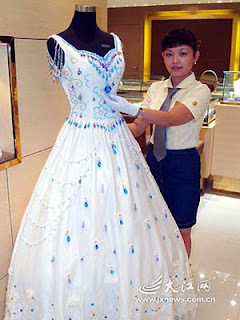 This wedding gown is not just like any other bejeweled dress, but it is bearing 9,999 Karats or about 2 Kilograms of gems! 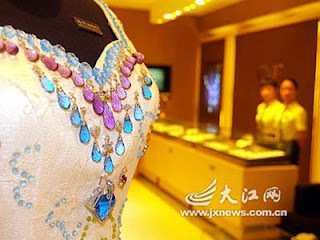 The wedding dress was put on sale yesterday, October 15th, at a jewelry store in Shangrao in eastern China's Jiangxi province. A report says it is a work by a well-known Hong Kong jewelry designer. The sky-high price has raised many eyebrows. Admirers said the dress was astonishingly beautiful, but they thought no one would make the bold purchase. Alright, I won't keep you waiting anymore, I intended to put the price at the end for the suspense. :) And.. drumrolls please.. Its price tag reads 999,999 yuan / 132,902 U.S. dollars. Now, let us see who the lucky..and of course, very rich bride will be, she who will march the aisle with this 9,999 Karat wedding gown.